Has numerous flowers in cone-shaped heads, 4-6 inches long, surrounded by stiff colored bracts. Named after Proteus, a Greek sea god with the power of prophecy. The specific epithet name repens means creeping. Flowers produce copious amounts of nectar, hence the common name “sugarbush”. The nectar was used medicinally to cure coughs and chest complaints in the 19th century. 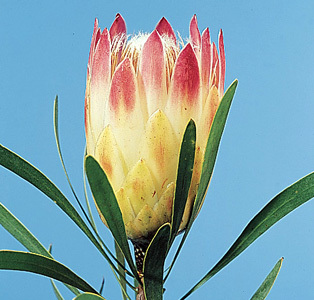 Sugarbush was the unofficial national flower of South Africa for 200 years but was displaced officially in 1976 when the King Protea (P. cynaroides) was designated the country’s national flower.